Emerging problems often surprise lawmakers and agency officials and result in rapid, reactive governance. The political attention an issue does receive may or may not be sufficient to resolve the emergent problem, and in many cases may be an overreactive auto-response dictated by public opinion and issue salience. 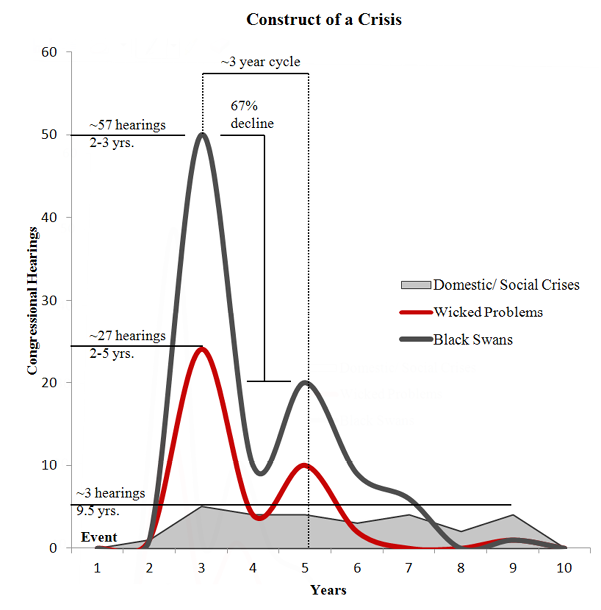 This study examines the emergence of congressional attention post-crisis; demonstrates that black swans, wicked problems, and complex domestic and social issues each trigger episodic attention differently; and finally, establishes a multi-dimensional model of emerging crises, laying the bedrock to define new theoretical models of episodic attention in Congress. I assigned quantitative values in place of typical qualitative descriptors of crises in order to derive crisis-values which could be tested for correlation to the degree of congressional attention an emerging crisis received.2 I then applied statistical analysis to examine relevant relationships between the characteristics of crises and the emergence of congressional attention. Consistently, findings of the analysis demonstrated with a high degree of confidence a strong relationship between a crisis’ characteristics and emergence of congressional attention, both in its total amount of attention and rate of emergence of attention. Based on findings, there remains little question that characteristics such as the size of the crisis, the intensity and rate of emergence, the resources the crisis requires, and the cause and culpability all contribute to the emergence of the issue-attention cycle and subsequently the policy window post-crisis. Punctuated attention caused by the episodic nature of emerging problems tends to result in extreme and rapid reactions of officials and thus causes the subsequent displacement of other issues on the public agenda.3 By more fully understanding emerging problems, what influences these issues, and what reaction they may garner, agencies such as the Department of Homeland Security can more fully align themselves post-crisis.4 This article is crafted considering the necessity to guide the reaction of governance post-crisis. We went, what, a month, month and a half, where people were pretty sure that Ebola was going to kill us all? Well, nobody asks me about it anymore. Congressional attention and legislative action post-crisis inhabit the intersection of several contemporary theories of political science and problem emergence, specifically Downs’ issue-attention cycle, Kingdon’s policy window, and Gerston’s characteristics of emerging crises. Downs’ issue-attention cycle is one of the foundational theories of this study and its findings. Downs theorizes there is a somewhat predictable five-stage cycle of attention that emerges after particularly powerful events. His theory of issue-attention represents how individuals react to salient issues that reach the public stage. However, this study has found that the issue-attention cycle is not confined to public interest alone, but rather is applicable to legislative attention as well. The process by which crisis attention emerges and declines—its issue-attention life-cycle—reveals patterns of congressional attention that are repeatable across crisis types. These patterns are evident in natural disasters, terrorism, civil unrest, and immigration issues and are identifiable at both macro (national) and micro (regional) levels. The emergence of legislative attention is the manifestation of what Kingdon refers to as the policy window. The policy window represents a finite period in which an issue’s salience and relative importance compels action on the part of the polity. This finite period is the famous ‘opportunity in crisis’ referred to by Rahm Emmanuel during the height of the economic crisis.7 It is important to note that while research conducted in this study clearly elucidates the issue-attention cycle, Kingdon’s policy window remains somewhat harder to demonstrate because of the potential for post-hoc reasoning. The emergence of political attention is not the same as the emergence of opportunity, which is triggered by the availability of specific preconditions. In many cases, although attention may be present and the issues compelling, there may be no political action. As theorized by Baumgartner, Gerston and others, emerging problems command attention by their salience (how novel the occurrence), their intensity (how rapidly they emerge), and the resources the problem demands (what will it “cost” to solve).8 Rochefort and Cobb contribute to this theory suggesting that culpability and blame also contribute to an issue’s relevance.9 In discussing the influence of these variables, and specifically their combined influence on emerging crises, Dr. Gerston explains, “[t]he more the categories grow in tandem, the more likely that they collectively will present a triggering mechanism.”10 This suggests a sort of synergistic effect which is confirmed by the findings of this study. Kingdon refers to the contributors of the policy window development as streams, the confluence of which activates the window. Kingdon’s streams (the problem, the political state, and available policies) do not all enter the process at the same time,11but rather the political state and policies may exist, merely awaiting the right problem and thus its issue-attention cycle to emerge. This work endeavors to better define what problems are more apt to generate significant political interest, thus compelling the emergence of the policy window and political action. This work answers the following questions. Do specific characteristics of a crisis, such as scope, intensity, timing, resources, cause, and fault enable and accelerate the emergence of attention post-crisis and give an issue the power to compel change in public and political opinion? Can the emergence and intensity of the issue-attention cycle and policy window be attributed to the characteristics posited by Gerston and others? In total, six variables, shown in Table 1, were selected for this study and tested for correlation to emergence of legislative attention. The six characteristics have been assigned numerical values based on their degree of severity and how substantially they affected the emerging crisis. Table 1 shows the qualitative and quantitative assignments given to each characteristic. Within Table 1, the novelty of the event may influence the perceived intensity and salience of the problem, and therefore may influence the value of intensity. Another factor to consider concerning the variable of timing is the event frequency. A higher frequency of similar powerful events may result in greater influence on the overall perception of the issue. To discover which variables are more prone to elicit congressional attention, a varied sampling of crises were selected, ranging in size, type, severity of impacts, and aftermath. Table 2 is a summary list of the crises in this research. The crises selected vary in economic impact, number of fatalities, socio-economic implications, region in which they occurred, and other critical factors. Measuring issue-attention and the public impact would be done through media syndicates and the degree of media output on a given issue. To measure political issue-attention for this study, congressional hearings on a given issue were used as the unit of measure to quantify the degree of issue-attention. Table 3 depicts the sources of data on congressional hearings and the timeframe of data gathered from those sources. Includes no. of hearings/ hearing data for issues. Hearings, media data, presidential remarks, etc. No. of hearings, reports, committee activity on given issues. Congressional hearings used to populate this study are cataloged using two sources: University of Texas, Austin College of Liberal Arts Public Policy collections, and the Library of Congress for hearings after 2010. Each source provides an aggregated list of all hearings on a particular policy topic. The data are collected in spreadsheets and counted for the number of times a particular set of words matching with the crisis arises, either within the title or the hearing description. An example would be counting the frequency of the occurrence of the term “terrorism,” found in the Hearing before the Special Oversight Panel on Terrorism to Review Department of State 2000 Report on Trends in International Terrorism. For each crisis, I calculated the total number of hearings, number of subsequent years the issue was heard, the mean number of hearings per year, and rate of emergence of the issue. Each crisis was then assigned a total value using the following model. and A= (Vf – Vi) / time; where Vi = n of hearings at initial emergence, and Vf = n of hearings at height. Taking the product of the first four characteristics and adding the remaining values for fault and cause, whether natural or manmade, will represent the total value of the combined six characteristics from Table 1. The result will be the net value of the crisis, represented by the variable (m). In determining a crisis’ final value T, equals m multiplied by the number of hearings the issue receives from Congress. Vi represents the number of congressional hearings occurring at the initial emergence of the crisis. Vf represents the number of hearings on the crisis at the highest point prior to decline. The time span of emergence (in years) from initial hearings to the hearings’ highest point is represented by t.13 Once acceleration is determined, it is multiplied by m, resulting in the total value of the crisis. This treatment was done in an effort to determine whether there are any similarities between emerging crises in Congress and, more importantly, to determine if greater values of variables correlate in any way to the number of hearings an issue receives. I used two correlation tests in this study. The first test, the multivariate analysis of variance (MANOVA), tests whether one or more independent variables correlate to two or more dependent variables. The second test employed was the univariate analysis, which was used as a verification of findings. As a good scientific practice, all tests were conducted using a confidence level of 95 percent (significance level α = 0.05). For a crisis, the variables cause and intensity have the least effect on congressional attention when evaluated independently of other characteristics. Whether an event is naturally occurring or human-caused is not as powerful as culpability (intent/ fault). This is evident in major crises such as Hurricane Katrina, which are arguably just as powerful in influencing legislative attention, if not more so, than crises such as September 11th and major oil spills. Further, the degree of injuriousness of the emerging crisis, measured as intensity, was deemed in this study as not significantly impactful to congressional attention when analyzed independently.19 Crises which are costly or which result in a significant number of fatalities, yet which emerge over long periods, are very isolated, or do not require substantial resources to abate, typically do not result in significant attention. This dynamic is manifest in the number of medical malpractice deaths compared to the threat of Ebola within the U.S. Although the latter garners enormous amounts of attention in Congress, media, and from the public, it is the former that claims nearly 440,000 lives annually.20 Similarly, single characteristics such as intensity, when coupled with others, for instance a crisis’ novelty or the rate of emergence, result in a synergistic effect causing a more significant influence on issue-attention. Examples of this dynamic include global warming and immigration reform. This pattern becomes especially pronounced when examining the issue by its rate of emergence, discussed further below. Findings suggest the more widespread and intense social issues become, the more they impact congressional hearings. This is a finding which is intuitively plausible when considering the emergence of the civil rights movement of the 1950s; an interesting proof will be the reaction of Congress to nationwide civil disturbances and police shootings/tactics emerging as this is written. If the issue of civil rights and police tactics continues to spread and continues to increase in intensity, there should be a sharp increase in attention by Congress followed by a gradual decline and period of stasis. The passage of landmark legislation such as the removal of the Confederate flag from the South Carolina State House grounds in 2015 represents a textbook example of the emergence and capitalization of the policy window at the regional level. Figure 1 illustrates the variance in emergence of the issue-attention cycle as related to the selected 24 crises in this study using exceedance probability and fitted power-law distribution where the y-axis represents the percentage of probability an event will not exceed and x­-axis represents the rate of acceleration of the issue-attention cycle. When observing the acceleration rate of congressional attention in evolving crises using exceedance probability, the sample naturally organizes itself into three distinct clusters of crises. The majority of the sampled crises fall within cluster (a), comprising up to the 50th percentile. This cluster is comprised of socially complex issues and domestic crises (tornados, obesity, housing, etc. ), emerging at a rate of between one and eight hearings annually. Cluster (b) is comprised of more complex crises including both Taleb’s black swans and Rittel’s wicked problems.21 The important distinction in cluster (b) is that the issues tended to be domestic in nature and lacking significant culpability (unaccompanied children, Ebola, Katrina, Global Warming). Crises falling within this cluster comprise the 50th to 90th probability percentile and tend to emerge at a rate of between 13 and 22 hearings. Finally, issues comprising cluster (c) are those with significant culpability. These are the most rapidly emerging issues and represent the highest 5% of probability emerging at a rate of greater than 25 hearings. Crises comprising this cluster include EXXON VALDEZ oil spill, Deepwater Horizon oil spill, and Da’esh (ISIS). These issues tend to be larger, have national implications, and have clear culpability. Deconstructing the emergence and decline of attention revealed a clearer illustration of the issue-attention cycle whereby most crises last approximately two to three years; in nearly all cases, including dissimilar crisis types, the decline in attention from its highest point will be ≈67% from the previous year. Of the total sample number of randomly selected crises, only four events exceeded a cycle of issue-attention greater than five years. This is illustrated in Figure 2. Figure 2 illustrates the general construct of crises and issue-attention based on the findings of this research. As illustrated in Figure 2, black swans result in extremely rapid emergence of political attention, though the decline is typically equally as steep. The mean rate of emergence of congressional attention for black swans in this study was found to be nearly twice the rate of wicked problems. The black swan is an anomalous occurrence representing catastrophes of the greatest scale whose emergence as shown in Figure 1 represent the 90 to 99th percentile probability of all cases within this study. During the decline of interest phase of Downs’ issue-attention cycle, both in the case of wicked problems and black swans, the initial retreat almost predictably approaches 67%, followed by slight resurgence in interest then complete withdrawal. This study has established that there is a relatively predictable cycle to political attention which is generated in many cases by the characteristics of and reactions to crises. The creation of the Department of Homeland Security is recent evidence of this reaction. Similar patterns of reactive governance can be found in the New Deal of the 1930s, growth in defense after World War I and II, and President Johnson’s War on Poverty—likely the most costly reactive endeavor of all.26 However, history has also demonstrated that most issues tend to be displaced quickly by others of ostensibly greater importance. In recent years, public interest has sharply faded regarding homeland security, particularly terrorism, only to re-emerge over concern for Da’esh. The nation’s intense focus on post-9/11 protection and fortification has been replaced by images of natural disasters, creating a change in focus to emergency management, preparation, and resilience. The decline and re-emergence of attention may be the recognizable manifestation of Downs’ issue-attention cycle, applied to homeland security and the contemporary political process. Once salient issues reach their dramatic climax, they become susceptible to being displaced from public attention (and the political agenda) by other newer problems as they emerge. This decline of issue-attention presents the larger challenge. A shifting political landscape means potentially changing priorities. These priorities are shifting to a new frontier of the war on terrorism as this is written. The push-pull dynamic in contemporary homeland security issue-attention consists of two dangerously asymmetric threats— Daesh and cyber-terrorism. The beginnings of a shift are occurring in cyber, a newly emerging field within homeland security marked by the creation of the Cyber Threat Intelligence Integration Center. The Federal Information Security Management Agency, established in 2002, increased its already growing budget by 100 percent from 2009 to 2010 following Executive Order 13636 and Presidential Policy Directive 21.27 Over the next three years, the agency’s budget continued to increase by $1.3 billion annually.28 With an event meeting the requirements of the characteristics of a crisis,29 cyber will arguably represent the next punctuated growth in homeland security. However, like other issues, cyber will predictably wane in several years as new priorities emerge to displace it. Already, cyber as an important issue to national security may be giving way to the threat posed to the West by Da’esh and home-grown extremism. In defining the patterns of episodic attention and political opportunity in crisis, there is an underlying ethical risk present. Significant crises often necessitate the re-examination, re-assessment, and, in some cases, re-structuring of the status quo political arrangements. An acute understanding of the transfer of attention and punctuated shifts of policy can better enable the astute, savvy politician to influence the attention cycle for gain, or it may likely present opportunity to not invest where it may not appear to be lucrative to do so for the long term (i.e. where there is no potential for growth or long-term political opportunity). Examples might include childhood obesity, civil rights, and social security reform. Issues of this kind, because of their lack of salience and power, are not likely to garner interest unless politically advantageous.30 It is generally accepted that one cannot go against public opinion and expect to stay in democratic politics for long. It has been attributed to President Woodrow Wilson, a career statesman, who said the public sentiment is like the wind used by a sailing ship. The sailor can use it to power a voyage but cannot sail against it. Therefore, knowledge of the attention cycle might enable politicians to align themselves with the emerging crisis likely to be most salient and ignore those that are not. The future spectrum and landscape of homeland security and protection against terrorism, the cornerstone of the Department of Homeland Security, represents the terrae incognitae—the land of the unknown. Investing in the protection against unknown and unknowable threats provides a real challenge to homeland security professionals in articulating policy change from equilibrium. Homeland security professionals should become astute at understanding threats, measuring their often-opaque environs, and most importantly articulating the value of investment in risk mitigation through resilience rather than protection against the unthinkable. To this end, this study establishes a pattern in emerging attention post-crisis in response to which legislators and agency officials can anticipate the emergence of the policy window. Crises with higher quantitative values elicit markedly higher degrees of congressional attention. For example, crises with high values in three of four characteristics will result in nearly 50 percent more hearings annually than crises with characteristics totaling a lesser value.33 Furthermore, the research presented has made clearer the subject of issue-attention. Through analysis, this study has validated findings that groupings of crises such as black swans, wicked problems, and socially complex and domestic crises result in varying degrees of congressional attention. 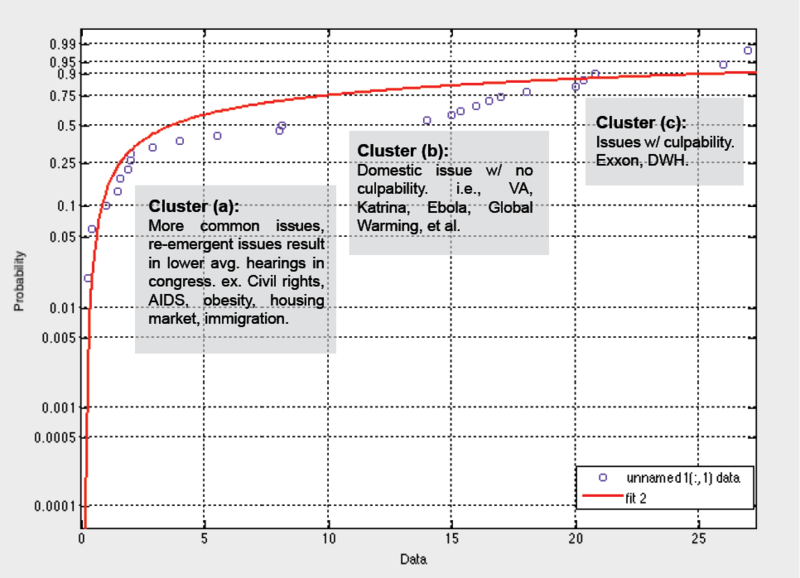 Quantitative data on social and domestic/ regional crises indicate, for instance, that the attention to these categories of crises lasts twice as long as wicked problems and black swans, yet accounts for approximately 10 percent of the number of hearings annually, with the median number of hearings each year between one and 15. This study has established a foundation to better understand the scope and duration of attention post-crisis. This understanding enables efforts to develop a model to support anticipatory governance of catastrophic events. Based on the data analysis in this study, it is clear that events will continue to occur with regularity and that events are somewhat predictable in their scope and scale, as is legislative reaction to such crises. Using statistical analysis and probability models may help to clarify emergent crises or at least better define the problem space and second order effects of a catastrophe. In addition, they may help mitigate reactive governance that tends to occur as a result of emerging crises. This is an area deserving of more scholarly attention, and although this study merely presents a foundation, it has shown the depths to which this subject can be mined. The duration of the issue-attention cycle and whether prolonged, heightened awareness creates a proportionate increase in negative sentiment. Understanding the issue-attention cycle and its consequences will more fully aid emergency managers, response professionals, and presidential staff in preparing both short- and long-term risk management messaging and strategies. Strategic communications of this nature may be communicated post-crisis to frame appropriately narratives of local and state officials, the public, and media. Analysts can define the emergence, timing, and duration of the issue-attention cycle to more accurately predict the policy window. Although contemporary research does examine what contributes to the emergence of issues, quantifying the timing and duration of issue-attention may prove a far more challenging task.34 Additional study should be undertaken to determine the re-emergence of the policy window without a triggering event. This dynamic is seen after most major crises, as noted in Figure 3, and relates to congressional attention as well as social media attention and public opinion polling. As Meadows eloquently suggests, history reveals a great deal about the potential of future events and can serve to greatly reduce the degree of irrationality and uncertainty that accompanies the events in the terra incognita. Employing systems models as theorized by Dr. Meadows, future research can define new theoretical models of episodic attention in Congress, examining how powerful coalitions affect the dynamics of issue-attention and political opportunism. By having a more acute sense of the reaction of governance to particular emerging crises, one can better prepare messaging and the general construct of political agenda setting. More importantly, the more precise understanding of emerging problems aids in more completely defining the landscape of complex crises, thereby lessening the need for reactive governance. Rather, it allows for a more measured and proactive post-crisis response. What would this look like in practice? Anticipatory governance goes to the theory of nineteenth century scholar of the English Constitution, Walter Bagehot. His theory of double government speaks to a bifurcated nature of governing. In double government, this is the division between Madisonian governance (reactive congressional decision making resulting from emergent attention post-crisis), and Trumanism (departmental decision-making and programmatic development which is measured and which guides legislative decision-making). The latter prevents reactive governing, which ultimately leads to anemic single-faceted regimes like the post-9/11 DHS. An improved understanding of the probability and the risks posed by a crisis to a community better allows for assessments of return on investment and intentional strategic messaging. By building a comprehensive landscape of a variety of dissimilar crises, one can see the patterns of attention emergence, calculate probability of occurrence and size of events, and develop programs that represent “over the horizon” preparedness and mitigation activities by investing in the necessary resilience needed to combat the ill effects of crisis. When the behavioral aspects of issue-attention post-crisis are known to decision makers, it should be more evident that an initiating event should not be needed to compel change. This changes the requirements of Kingdon’s tenets, and may perhaps even change the notion of a policy window. The merit of this research transcends the organizational or political future of a single entity or specific stakeholder. Ideally, this work will provide a completely different lens through which to view the dynamic of emerging crises and episodic attention, providing an opportunity to see things, understand them, and then react differently. Lieutenant Christopher Kimrey is an 18 year career military officer with the U.S. Coast Guard. A top-level crisis management professional and graduate of Naval Postgraduate School’s Center for Homeland Defense and Security, he is currently studying public policy and administration at The University of Pennsylvania Fels Institute of Government in Philadelphia. He may be reached at cmkimrey@gmail.com. The theories and hypotheses posed herein are those of the author and do not reflect those of the U.S. Coast Guard, Department of Homeland Security, or University of Pennsylvania. 1 John W. Kingdon, Agendas, Alternatives, and Public Policies, 2nd ed. (New York: Longman, 2003), 165-169; Anthony Downs, “Up and Down with Ecology – The Issue-Attention Cycle,” Public Interest 28, (1972): 28-50, accessed from http://www.unc.edu/~fbaum/teaching/articles/Downs_Public_Interest_1972.pdf . 2 Selected crises were valuated using the following model: T= m*A, where m = f(scope, intensity, time, resources, fault, cause), and A = (Vf-Vi)/time; Vf = n of hearings at initial emergence, Vf = n of hearings at height. 3 Arjen Boin, The Politics of Crisis Management: Public Leadership Under Pressure (Cambridge: Cambridge University Press, 2005), 2. 4 Bryan D. Jones and Frank R. Baumgartner, The Politics of Attention: How Government Prioritizes Problems (Chicago: University of Chicago Press, 2005), 4–5. 5 The full study of this article, titled “Learning to See the Opportunities in Crisis and Catastrophe: A Decision Maker’s Guide to the Issue-Attention Cycle” can be found at https://www.hsdl.org/?view&did=788378; Christopher Kimrey, “Learning to See the Opportunities in Crisis and Catastrophe: A Decision Maker’s Guide to the Issue-Attention Cycle,” Thesis. Naval Postgraduate School (U.S.). 2015. https://www.hsdl.org/?view&did=788378. Issy-les-Moulineaux, France, White House, Office of the Press Secretary (December 01, 2015), https://www.whitehouse.gov/the-press-office/2015/12/01/press-conference-president-obama . 7 Gerald F. Seib, “In Crisis, Opportunity for Obama,” The Wall Street Journal, November 21, 2008, http://online.wsj.com/news/articles/SB122721278056345271 . 8 Larry Gerston, Public Policy Making: Process and Principles, 2nd ed. (New York: M.E. Sharpe, 2004), 25; Dominic Johnson and Elizabeth Madin, “Paradigm Shifts in Security Strategy: Why Does It Take Disasters to Trigger Change?” Natural Security: A Darwinian Approach to a Dangerous World, ed. Raphael D. Sagarin and Terrence Taylor (Berkeley: University of California Press, 2008), 226. 9 David A. Rochefort and Roger W. Cobb, The Politics of Problem Definition: Shaping the Policy Agenda (Lawrence, KS: University Press of Kansas, 1995), 21. 10 Dr. Larry Gerston, email correspondence, October 17, 2014. 11 Kingdon, Agendas, Alternatives, and Public Policies, 172. 12 Rochefort and Cobb, The Politics of Problem Definition, 21. 13 The equation ((vf-vi)/t) represents the acceleration of the emerging crisis. 14 Daniel Kahneman and Ivan Tversky, Thinking Fast and Slow (New York: Farrar, Straus and Giroux, 2011), 218. 15 Selected crises were valuated using the following model: T= m*A, where m = f(scope, intensity, time, resources, fault, cause), and A = (Vf-Vi)/time; Vf = n of hearings at initial emergence, Vf = n of hearings at height. 18 Dominic Johnson and Simon Levin, “The Tragedy of Cognition: Psychological Biases and Environmental Inaction,” Current Science, Vol. 1, No. 11, (2009), 1592. 19 Wilks’s λ = 0.057, F= 3.17 (4/4), P = < 0.145. 20 Marshall Allen, “How Many Die From Medical Mistakes in U.S. Hospitals?” ProPublica, Sep. 19, 2013, Retrieved from http://www.propublica.org/article/how-many-die-from-medical-mistakes-in-us-hospitals. 21 The term black swan refers to Nassim Taleb’s theory of crises comprised of three characteristics: highly rare, unexpected, and predictable when viewed retrospectively. Rittel and Webber’s wicked problems as posed in his 1973 Policy Sciences article “Dilemmas in a General Theory of Planning” refer to hyper-complex social problems that are difficult to describe and have no apparent or right answers. 22 Rochefort and Cobb, The Politics of Problem Definition, 17. 23 Frank Baumgartner and Bryan Jones, Agendas and Instability in American Politics (Chicago: University of Chicago Press, 1993), 90. 24 Stephen Jay Gould, Punctuated Equilibrium (Cambridge, MA: Harvard University Press, 2007), http://site.ebrary.com/id/10318436, 39, 41. 25 It is interesting to note, not only does a sharp decline and secondary emergence occur in congressional attention, but also the same decline and re-emergence can be identified in public opinion. 26 $22 trillion Spent on Anti-poverty Programs as of 2014; Robert Rector and Rachel Sheffield, “The War on Poverty After 50 Years,” The Heritage Foundation (September 15, 2014) http://www.heritage.org/research/reports/2014/09/the-war-on-poverty-after-50-years. 27 Eli Dourado, “Federal Cybersecurity Breaches Mount Despite Increased Spending,” George Mason University, Mercatus Center, January 20, 2015, http://mercatus.org/publication/federal-cybersecurity-breaches-mount-despite-increased-spending. 29 An event of this nature may be similar to the OPM data breach in June 2015, which compromised the personal data of nearly 4.2 million Americans. 30 Emily Sherman, “Candidates Ignoring Coming Social Security Crisis, Critics Say,” CNN, October 23, 2008, http://www.cnn.com/2008/POLITICS/10/23/social.security/index.html?iref=24hours. 31 Kingdon, Agendas, Alternatives, and Public Policies, 165–169. 32 Bruce Bueno de Mesquita and Alastair Smith, The Dictator’s Handbook: Why Bad Behavior is Almost Always Good Politics (New York: Public Affairs, 2011), 19. See also Boin, The Politics of Crisis Management, 122–123. 33 Crises ranked high in three of four characteristics, totaling a value of 2.7, result in 49 percent more hearings than those less than 2.7. 34 This conclusion is based on the fact that issue-attention is human-based and therefore is inexact. 35 Donella H. Meadows and Diana Wright, Thinking in Systems: a Primer (White River Junction: Chelsea Green Pub., 2008), 80. 37 Jan Christian Smuts, Holism and Evolution (London: MacMillan and Co., 1926), 103.